factors in choosing the right tile for your floors is the consideration of installation and application. For example, installing tile can involve spacing of the tiles or it can be purchased in sheets, which are easier to apply. Many homeowners choose larger tiles for their main living areas because of the ease of installation. Smaller rooms may need smaller tiles or can even include intricate patterns as showpieces. One of the best floor options for every type of home or office is tile. This is a beautiful and timeless look which comes in varieties to match every design preference. Some types of tile can withstand up to 25 years of wear and tear. Ceramic Tile: This type is made from clay materials and tends to be brown, red, or white in color. It is highly durable as well as stain resistant. A great way to increase the value of a home is to clean out the grout in ceramic tile. This will instantly make old tile look newer, which, consequently, increases the value of your home. This is a quick fix that could mean a few extra dollars in the long run. Hardwood: If you are thinking of changing the flooring in your home, go with hardwood flooring. Hardwood is much easier to clean that carpeting and other kinds of wood. It is also very strong and durable and looks attractive. Another advantage of hardwood is that it can refinished from time to time, so it can always appear to be brand new! Hardwood floors are elegant and tasteful, and they are easy to maintain. Nice hardwood flooring shines and speaks volume about the value of your home. Granite: A type of hard natural stone commonly used in countertops and tile because it is so resistant to wear and tear. The speckled minerals that stand out from the rock make it easy to clean. Marble: This is one of the oldest building materials because of its natural beauty and strength. It is less dense than granite so it is great for a living area or a bedroom. Stone counter-tops come in a range of patterns and colors, and are possibly the most durable surface that you can choose. Sold in slabs, they are waterproof and heat resistant, and resist scratches and stains. While they tend to be quite expensive, it is worth the investment, as they last a very long time, and add value to your house. 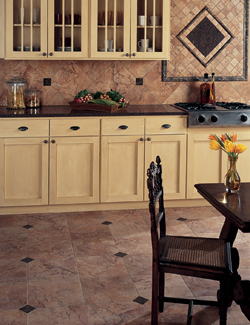 Vinyl: This tile is manufactured and is less expensive than other types. Many people choose luxury vinyl tile in their high-traffic, moist areas such as bathrooms and laundry rooms. These are the most popular styles of tile because they are both stylish and durable. Let us explore your many options in our flooring showroom. We are sure to help you select the perfect tile flooring for your anywhere you choose. Laminate: If you are renovating your kitchen but need to spend less money, consider using laminate flooring and countertops. These synthetic options are generally much less expensive than wood, tile, or stone. They are also easier to care for. Many of these products are designed to closely mimic the natural products, so that the difference is only visible on close inspection. These are the most popular styles of tile because they are both stylish and durable. Let us explore your many options in our flooring showroom. We are sure to help you select the perfect tile flooring for your anywhere you choose. Also, tile flooring can be installed in any room because it is moisture-resistant and will withstand a great deal of foot traffic. When trying to fix up a house to flip it, pay attention to the kitchen. If has linoleum floors, replace them with tile. It makes the place look much better. You should examine the counters and look at replacing them. They don't have to be granite, but granite counter tops increase the value of the home and up your chances of selling it. Bathrooms are also key to anyone planning to flip a house. Most rooms, like bedrooms and living rooms, can easily be customized with tile floors for buyers to fit their style. However, you want to make sure the bathrooms are in good condition. Make sure your tub/shower and sinks are all up to par, and if they aren't, replace them. Swap any linoleum floors for tile floors. Are you ready to redecorate your house with fresh flooring? Stop by the Hollier’s Flooring America flooring showroom in Lafayette today to view our collection or contact us at <PHONE> to request an appointment for a free in-home measurement! Financing options available. We proudly serve the communities of Lafayette, Carencro, Youngsville, and surrounding cities.